Chicken pot pie remains one of the most comforting dinners of all time. 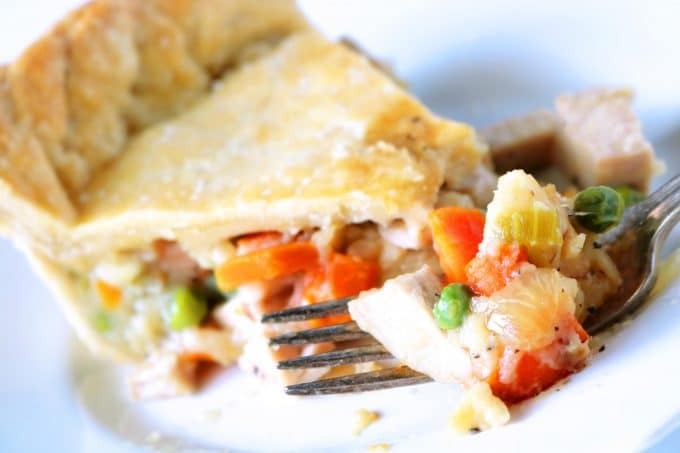 With a delicious, savory filling of juicy chicken, tender vegetables, and a creamy gravy enclosed in a double-layer of flaky pie crust, it’s really no wonder this dish has stood the test of time. If you’re looking for a foolproof, homemade chicken pot pie recipe you’ve come to the right place. Made with real ingredients and no cans, this recipe has received stellar reviews from taste testers. 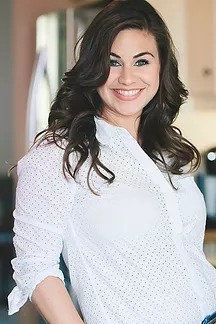 Today, in addition to delivering the best chicken pot pie recipe, we’ll also cover some helpful tips for making homemade pie crust for chicken pot pie, why a handful of simple ingredients is all you need to make a perfect, creamy pot pie filling from scratch, ways to customize your pot pie vegetable line up, and more! A flaky chicken pot pie crust on both the top and the bottom. 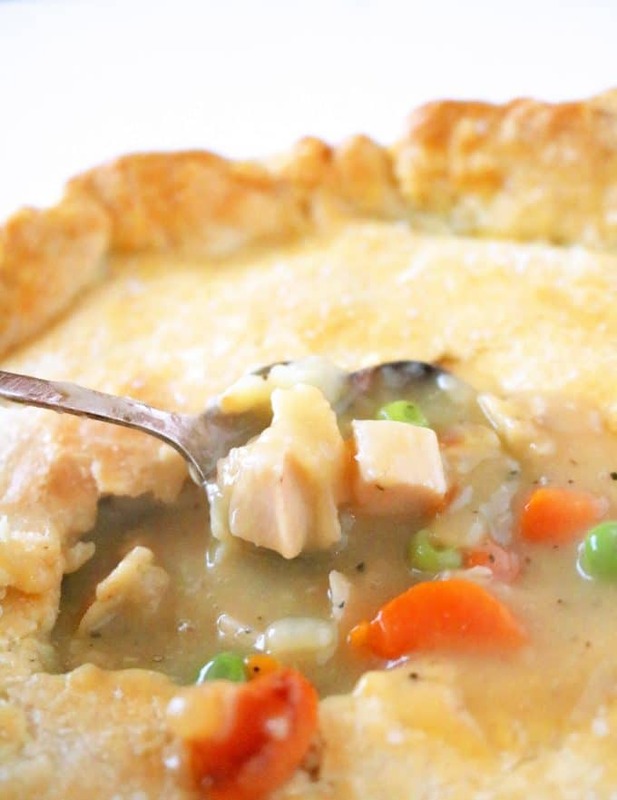 A creamy, savory chicken pot pie gravy. A hearty serving of white meat chicken and a hefty serving of vegetables. When it comes to a good, old-fashioned chicken pot pie, it’s got to be a buttery, flaky pie crust enclosing that glorious filling. If you’re looking to save a little time on a busy weeknight, purchase two uncooked pie crusts from the grocery store and knock out your recipe using those. However, if you have a spare 10 minutes (well 10 minutes and some time to hang while the dough chills), a homemade chicken pot pie crust is most definitely the way to go. Making the chicken pot pie crust itself takes no time at all, but you’ll need to plan accordingly and work about 2 hours in advance. This is how long it will take your pastry to chill before you should begin working with it. You can even make your homemade crust a day or two in advance and leave it in the refrigerator until you’re ready to work with it, or you can freeze it. 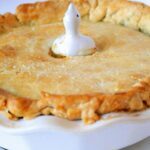 To freeze pot pie crust, you would simply follow the recipe as directed and then place the plastic-wrapped crust in a freezer-safe, zip-top bag, and thaw it in the refrigerator the night before you intend to make your chicken pot pie. To make a chicken pot pie crust from scratch, you’ll whisk together flour, and salt, cut in cold butter and shortening using either a pastry blender or your food processor, and then drizzle in ice-cold water. 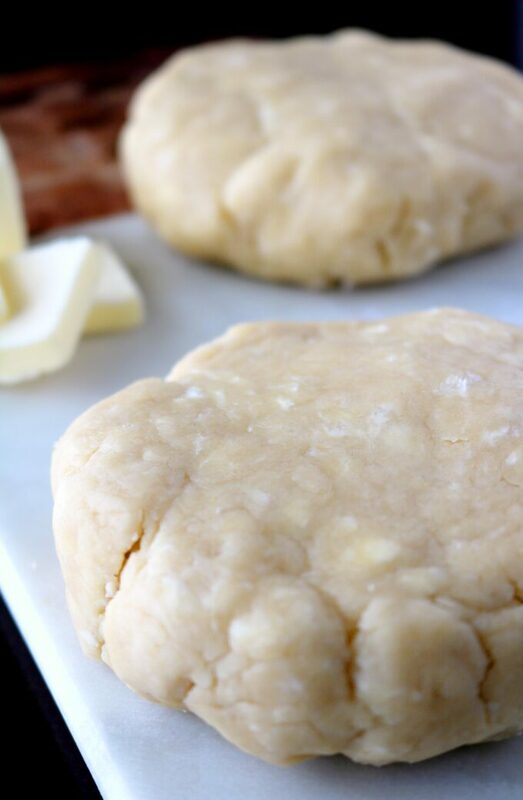 Mix until a dough has formed, divide into two discs (preferably with one disk being slightly larger than the other), and transfer to the refrigerator to chill. When the dough is ready, you’ll roll out the bottom crust, lay it in the pie dish, and add your filling. Then, roll out the top pie crust and cover your pot pie with it, bring the bottom crust up and over the top, pinching the two together to enclose. For an extra golden crust and a special touch, brush the pie crust with egg wash and sprinkle with Kosher salt. Once baked, it will be perfectly golden, flaky and buttery, and the perfect addition to the best chicken pot pie recipe. Did you know that the classic filling for chicken pot pie is actually a gravy? Yes! It consists of flour, oil, and chicken broth. There are no thickeners like canned soup or cream cheese in this pot pie recipe. You simply don’t need them. 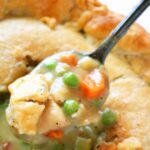 Flour is all you need for a thickener, and your gravy will be rich, savory, and exactly what you would expect in a traditional chicken pot pie filling. To make sauce from scratch for chicken pot pie, you’ll sprinkle the flour over vegetables which have been sauteed in oil. Once the flour begins to look somewhat glossy you’ll add in your chicken broth a splash at a time. This method ensures a smooth and luscious gravy every time. You’ll continue to add in small increments until the mixture starts to resemble a pudding-like texture, at which point you can add the remaining liquid and let it simmer until slightly thickened. If you’ve never made a homemade sauce like this before, fear not — this method is foolproof for making gravy. 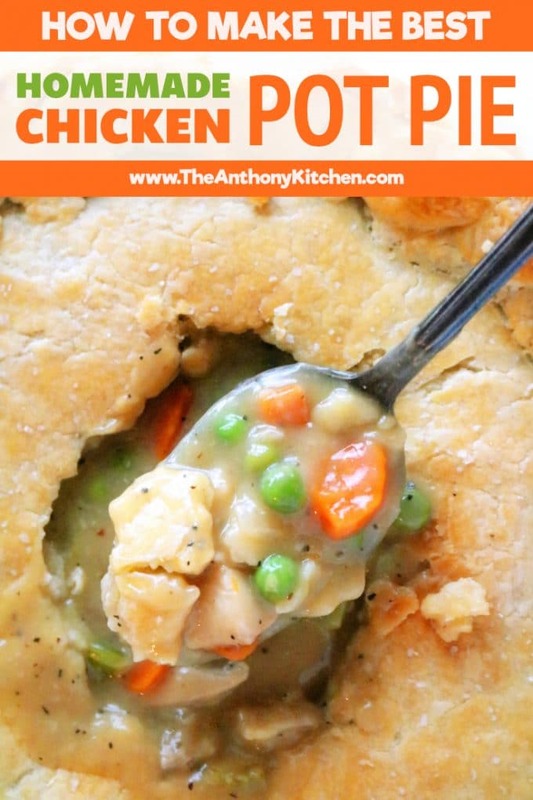 The vegetables in this chicken pot pie recipe were kept simple and are as follows: Carrots, celery, peas, and onion. However, you can easily omit any one of those and add in others like potatoes or onions, if you’d like. More info on that ahead. To prepare the vegetables for chicken pot pie, you begin with diced onions and carrots. The diced vegetables go into a large sauté pan with butter and oil. Butter for flavor, and oil to keep them from browning too quickly. Once the vegetables have softened, you’ll continue on to making that roux we spoke of for your homemade chicken pot pie gravy. Peel 1 Russet potato and dice it into small 1/4″ cubes. Note, if you want the potatoes to cook through in your chicken pot pie, you must dice them small. Add to the pan with the carrots, celery, and onions, and proceed with the recipe from there. Wipe clean an 8-ounce package of button mushrooms and quarter them. Add them to the gravy at the same time as the peas, and proceed with the recipe from there. Good news: You’ve got options when it comes to the chicken for homemade chicken pot pie. For a weeknight shortcut, you could use a rotisserie chicken, and some grocery stores are even selling freshly prepared cooked and shredded white meat chicken. However, I use my go-to chicken recipe for Oven-Baked Chicken Breasts. It’s simple, easy to make, and the chicken will turn out juicy and succulent every single time. Below is a quick demo for how to make it. If you’re preparing the chicken yourself, I suggest dicing it rather than shredding it for chicken pot pie. It’s a classic way of preparation for pot pies and makes for the perfect bite in combination with the vegetables. All of the ingredients inside the pot pie are already cooked, so they only thing we are concerned with at this point is the pie crust. The crust should be fully baked with 45-50 minutes. If the top crust should start to look golden brown before the time is up, simply cover the edges with either a pie shield or with aluminum foil and continue cooking for the allotted amount of time. There is nothing like a made-from-scratch chicken pot pie. Especially one enveloped in a buttery, flaky, homemade pie crust, decked out with perfectly cooked chicken and vegetables, all smothered in a to-die-for chicken gravy. Please, enjoy! Creamy Chicken and Dumplings is a hearty family dinner that has rightfully earned its spot on the Southern table. This recipe takes the intimidation factor out of the dish, and is made easy with drop dumplings — no rolling pins required! Cheesy Chicken Broccoli Rice Casserole features juicy, shredded chicken, perfectly cooked broccoli, melty Colby Jack cheese and a crunchy Cornflake topping! It’s the perfect comfort food casserole! Chicken Spaghetti is a cheesy chicken casserole with great, big flavor that feeds a crowd and keeps ’em coming back for seconds! Featuring shredded chicken, peppers and mushrooms, spaghetti and melty Cheddar cheese. Baked BBQ Chicken features chicken legs and thighs coated in a barbecue sauce and baked to crispy perfection! BBQ Chicken Sandwiches are quick-cooking and great for weeknight dinners! Thinly sliced chicken, melty cheese, and red onion all piled on a sesame bun dripping with a tangy barbecue sauce! The Anthony Kitchen is your comfort food recipe headquarters, and if you’re looking for more homemade comfort food dinner ideas, we have some seriously spectacular suggestions for you. Spaghetti and Meatballs, Fork Tender Pot Roast, and Chicken Fried Steak ought to get you on the right track. But, if you’re looking for even more, be sure to head over to our Comfort Food Dinners page for more comforting dinnertime ideas. 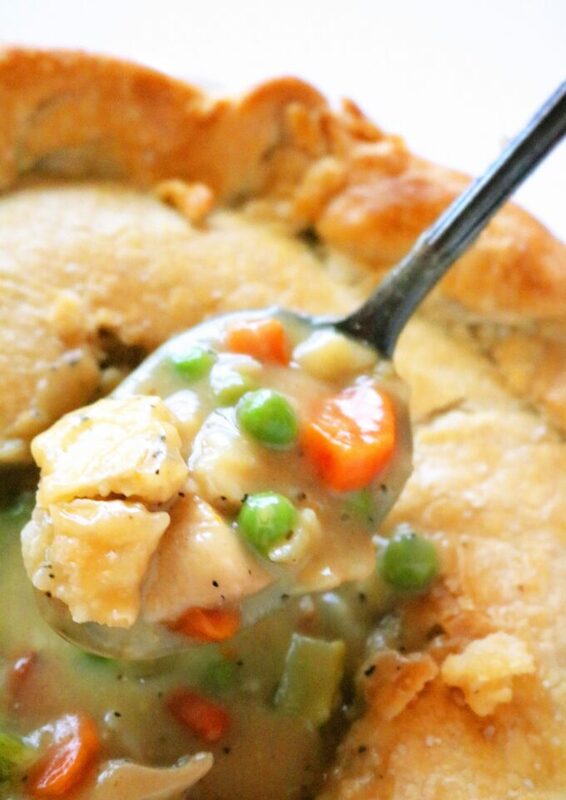 Homemade chicken pot with succulent diced chicken, perfect flaky crust, hearty vegetables and chicken gravy. Preheat the oven to 400° and have ready a greased, 9" (preferably deep dish) pie tin. Add butter and oil to a large saucepan or Dutch oven over medium heat. As soon as the butter has melted, add the celery, carrots, and onion and sauté until softened, about 8 minutes. Add the garlic and sauté 1 minute more. Sprinkle flour over the vegetables and stir until evenly coated. Add the chicken broth a splash at a time, whisking after each addition, until the mixture begins to resemble a thick pudding. Once this consistency is reached, the remaining broth can be added in. Add the salt and pepper, and increase the heat to medium-high. Allow the mixture to simmer, stirring often, about 5 minutes or until slightly thickened. Stir in the peas and the diced chicken, and set aside until ready to use. Roll out the pie dough so that it is a 1/4" thick. Lay one dough round on across the bottom of the pie dish, and allow the excess to lay over the sides of the dish. Pour the chicken and vegetable filling into the dish. Roll out the second dough round just the same, and place it over the dish. Crimp the edges of the pie crust together. To make the egg wash, whisk together the egg and water, and using a pastry brush, lightly brush the mixture across the top crust and the edges. 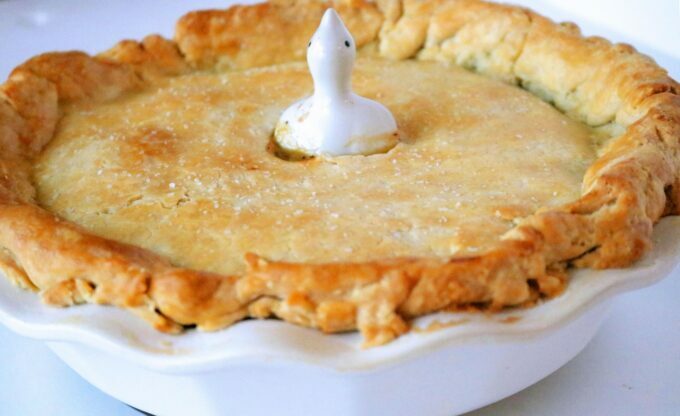 Create vent holes in the center of the pie, and transfer to a sturdy, rimmed baking sheet to catch any spillage. Bake the pie for 20 minutes. Then, reduce the temperature to 350°, and bake for 25-28 minutes more, or until the top is golden-brown. Use a pie shield to prevent the edges from over-browning. Remove from the oven and allow to cool for 15-20 minutes before cutting into. Serve and enjoy. See The Anthony Kitchen's recipes for "Perfectly Cooked Chicken Breasts" and "Perfect Flaky Pie Crust" if needed. The perfect recipe for a flaky, buttery homemade chicken pot pie crust! Place butter and shortening cubes in the freezer temporarily to harden. Add flour and sea salt to a food processor fitted with blade attachment. Pulse until evenly incorporated. Add the butter and shortening cubes, a few pieces at a time with the motor running, until all fats are incorporated and pea-sized clumps begin to form. Slowly drizzle in a ½ cup of water, pulsing all the while. Transfer the mixture to a mixing bowl and knead until the mixture comes together. Alternatively, use a pastry blender and a large mixing bowl to cut in the fats, and sturdy wooden spoon to stir in the water. Cut the dough ball in half using a knife or a pastry cutter, and form into two flattened round disks. Wrap in plastic wrap and place in the refrigerator until chilled through, at least 2 hours. Dough will be sticky if not properly chilled. Makes two 12” dough rounds. Hi Cindy! I just loved reading this and thank you so much for letting me know 🙂 Thrilled you like the pot pie, and that crust is my FAVORITE too! So glad you enjoyed that as well. Thank you again, Cindy!